The Riverside High School track and field squad found some success at the Bill Gerrard Memorial Saturday in Greybull. As a team, the Rebels placed sixth with 35.5 points, six points behind Greybull and 13.5 points ahead of Shoshoni. The Lady Rebels placed seventh with 29 points, 15.5 points behind Rocky and one point ahead of Meeteetse. 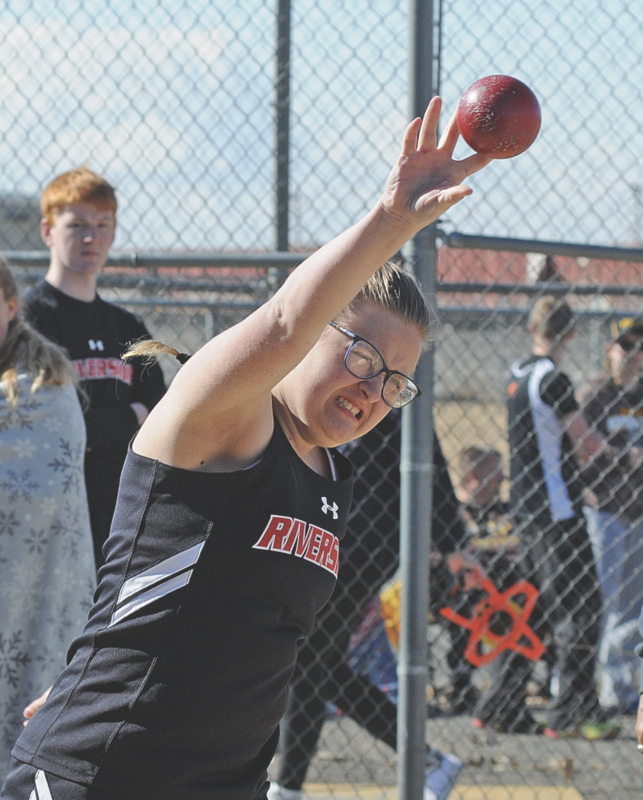 Riverside freshman Kieri VanDeest gives it her all in the shot put during the Bill Gerrard Memorial Saturday in Greybull. In individual results, freshman Garret Ellis-Rudd placed third in the 110-meter hurdles, crossing the finish line in 17.77 seconds to set a new personal record, and in the 300-meter hurdles, finishing the event in 47.53 seconds. He also placed fifth in the high jump by clearing 5-6, and seventh in the triple jump by sailing 35-6¾. Senior James DesRosier placed fourth in the 110-meter hurdles, coming in at 19.43 seconds, and fifth in the 400-meter dash, finishing the oval in 1:01.44. Junior Ryan Miller placed sixth in the 200-meter dash, finishing the half-lap in 26.52 seconds, and 10th in the triple jump, jumping 31-6½. He also set a season best in the 100-meter dash, finishing the sprint in 12.64 seconds to place 11th. Sophomore Cody Thompson placed fourth in the two-mile run with a time of 13:32.12, and fourth in the 400-meter dash with a time of 1:07.67. Freshman Griffin Zapata placed eighth in the shot put with a throw of 32-7½. Sophomore Breanna Riley set a new personal record in the triple jump with a seventh-place jump of 29-1½. She also placed third in the 100-meter hurdles, finishing the event in 18.96 seconds, and placed ninth in the 100-meter dash, finishing the sprint in 14.23 seconds. Junior Summer Riley also set a new personal best in the triple with a sixth-place jump of 29-8. She also placed fifth in the 800-meter run, completing the two-lap race in 2:54. Freshman Eva Stone placed fifth in the 400-meter dash, completing the oval in 1:13.31, and sixth in the long jump with a jump of 13-3. Freshman Jersey Streitz placed seventh in the 110-meter hurdles with a time of 21.95 seconds, and ninth in the triple with a jump of 27-5. Senior Emmy Reid placed fourth in the discus with a throw of 82-1, and 10th in the long jump with a jump of 12-11. The Rebels will compete at the Burlington Invitational Friday at 1 p.m.
“In Burlington, I would like to see some kids setting some goals and working towards them,” Collingwood said. “We still have a few athletes that need to get their endurance up. I would like to see us put together a couple relay teams in the 4×8 or medley relay. I feel like we have some girls that could run a decent medley relay and boys that would be really good at a 4×8, but we will see how this week of practice goes. I am planning on us getting some cardio work and focusing on events and form to see how we will do.